Dietary allergies and food intolerances are surprisingly common in cats. They usually develop in young or middle aged cats and can cause a variety of problems affecting the digestion as well as the skin. Usually they will be to one or more specific proteins in the diet. None of the dietary proteins which commonly cause these reactions are present in Hill's Prescription z/d Diets, so feeding the diet for at lease 6 weeks will allow the reaction to subside and the symptoms improve. Ingredients: Original: Brewers' rice, rice protein concentrate, chicken liver hydrolysate, soybean oil, cellulose, minerals, animal fat, digest, taurine, vitamins, trace elements and beta carotene. With a natural antioxidant (mixed tocopherols). A 156g can of z/dTM Feline canned is equal to 45 grams of z/dTM Low Allergen Feline dry. Reduced amount Helps minimise adverse food reactions. Essential fatty acids Increased Helps nourish the skin and coat. Superior antioxydant formula Added Neutralizes free radicals. Chicken liver hydrolysate, maize starch, vegetable oil, cellulose, calcium carbonate, DL-methionine, dicalcium phosphate, potassium chloride, iodised salt, taurine, calcium sulphate, vitamins and trace elements. Proteins with a molecular weight less than 10,000 daltons are unlikely to be detected by the immune system. The animal protein in z/dTM ULTRA Allergen-Free Feline is extensively hydrolysed (a major part of the protein has less than 3,000Daltons in size) to minimise the risk to be detected by the immune system. The carbohydrate source is maize starch, refined to contain less than 0.3% vegetable protein. The fat source is vegetable oil, purified to contain no protein. 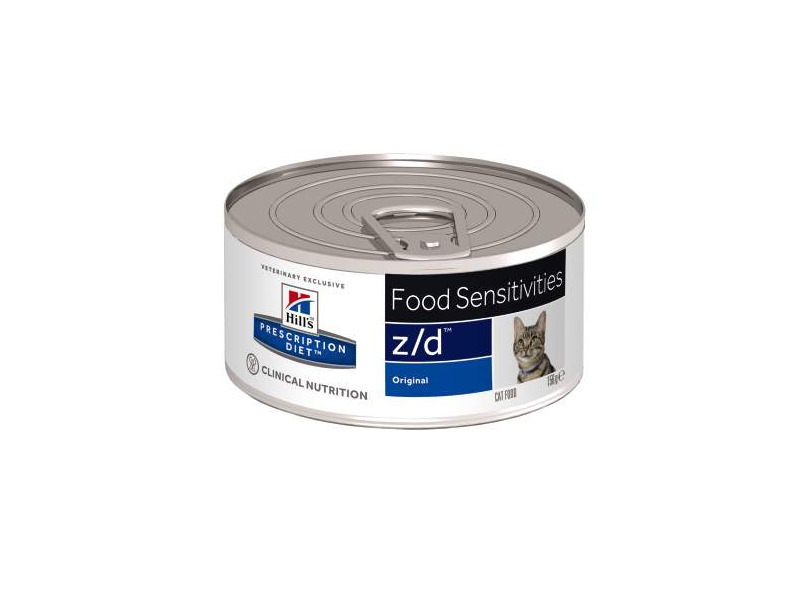 z/dTM ULTRA Allergen-Free Feline only exists as canned food, if preferred, it can be fed together with z/dTM low Allergen Feline dry, if the cat does not have an adverse reaction against rice. Gastro-intestinal disorders such as inflammatory bowel disease (including colitis). 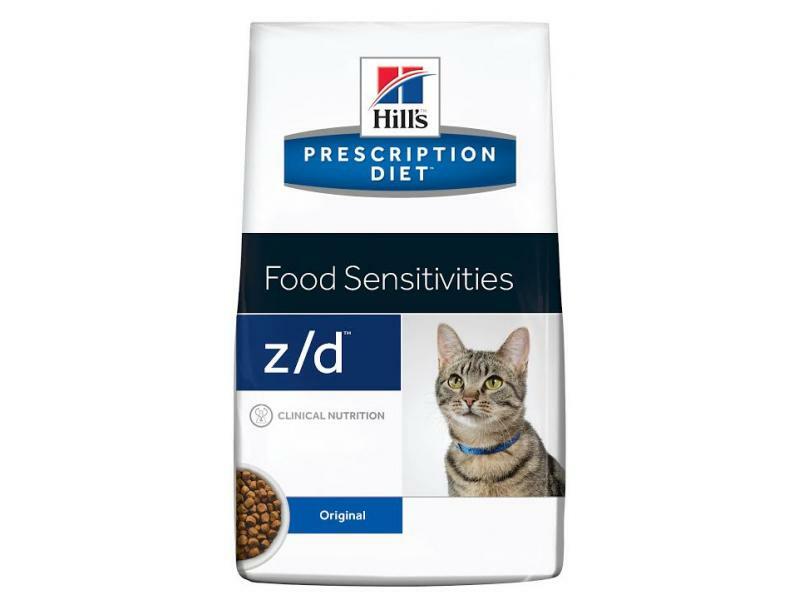 Below are some recent questions we've received regarding Hill's Prescription Diet z/d Food Sensitivities Cat Food, including answers from our team. These two diets are completely different and are used in different situations. The z/d is processed so that it cannot contain any food allergens at all (theoretically). If there is a genuine concern about a dietary allergy, z/d is a good choice. The Sensitive diet is not free of allergens and might cause trouble if a cat happens to be allergic to one of the ingredients. The good thing about the Sensitive diet is that it is generally very easy to digest, so most cats will do well on it if they are prone to diarrhoea for other reasons. It would be fine to use in a cat with a flea allergy.